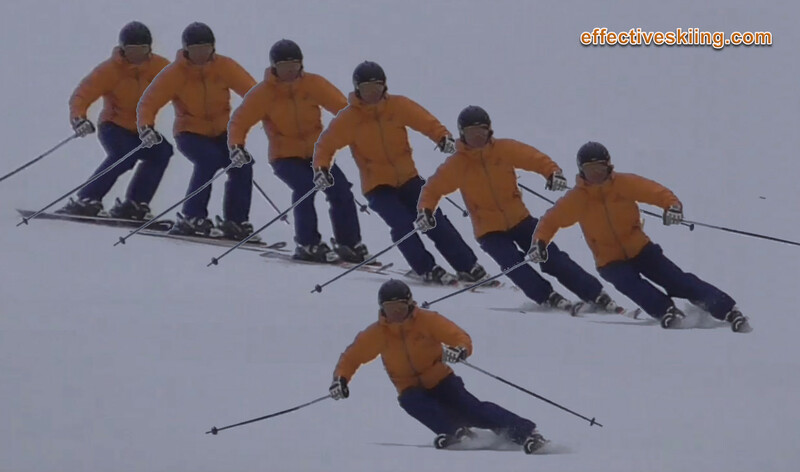 Tipping is the action of rolling the skis on edge. It is the most effective way to make the skis turn because of the Sidecut and its interaction with the snow and one of the fundamental skills of any expert skier. The best description of this action or movement is to roll the ski up on edge, using the edge as a hinge. Tipping is a specific movement to put the skis on edge, which starts with the feet and ankles, via Inversion and eversion and enabled by dorsiflexion and Flexing. This is what is usually referred to in racing circles as "rolling the ankles". In the essentials framework, tipping is the first primary movement. Tipping is a definite movement of the lower body. Sometimes edging the skis is described as a result of inclination or angulation, leaving the impression that we're dragging the skis on edge with the upper body. That is possible, but incorrect and inefficient, see hip dump! Inclination of COM and moving the hips inside the turn allows the skis to edge when the legs are long, but we need to focus on a clear, separate and definite rolling of the skis on edge from the feet. We always separate the upper body from lower body movements. Note the difference in perspective between "moving the body inside the turn" and "extending the outside leg". Although often two sides of the same coin, the second seems more applicable to high performance skiing. The most visible part of tipping is not the ankle movements, which are more or less subtle even if vigorous and inside the boots - the most visible part of good tipping is the knees moving side to side. Flexing of the knees allows tipping in the sense that it allows the knees to be moved side to side from the ankles, without moving the hips. They can also be moved side to side by femur rotation and this sometimes in fact helps tipping, but that only comes in handy in high-performance skiing, at high edge angles and deep flexing - until then, a focus on strong femur rotation tends to slow learning the edging skills and impacts carving ability, as it tends to take the skis off the edge. When flexing is not used, some refer to knee angulation++ when, with a long leg, the knee is pushed into the hill. This is generally a weak movement however... the knee is not really designed to flex sideways and, in general, the less stress is applied on the knees, the better. 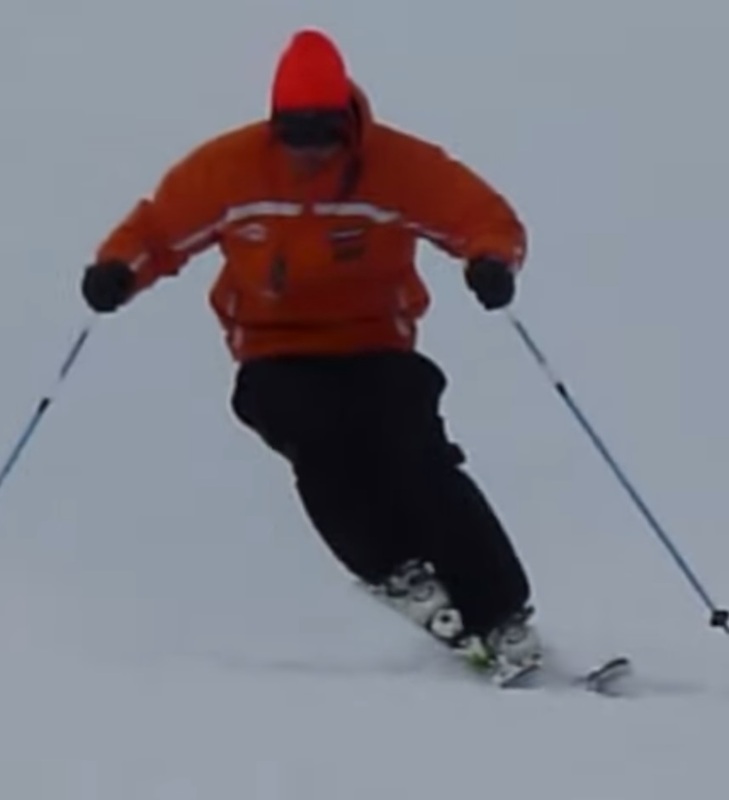 Edging appears in all ski instruction systems, in different ways, most connecting it to foot and ankle movements in the same sense as tipping here. However, while tipping is a very specific set of movements and accompanying skills, edging is just a skill, related to putting the skis on edge. Often, edging and inversion/eversion are considered a form of angulation, as a lateral movement1. Edging is considered a result of angulation rather than its own movement and also, sometimes, edging is considered a result of inclination, in the sense that inclination into the turn (moving the COM/hips into the turn creates edging of the skis). This point of view however, tends to focus attention on big body muscles and away from fine ankle action. 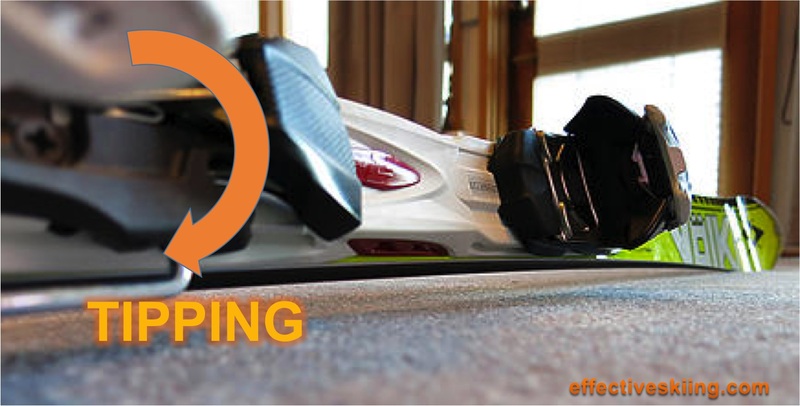 In racing, edging is important and described as the movement to roll the skis on their sidewall6, starting from the ankles and feet and followed by inclination or angulation to increase the angles and in that sense is similar to our use of tipping here. It is so important for expert skiing and racing that one of the turn phases is sometimes named edging6. Edging is considered the essential skill for carving, but we see the action of rolling the skis on edge to be the essential skill for skiing, not just when carving, but all the time. And we will focus on the most effective ways to do that: regardless of whatever else we do on skis, we should tip them on edge first and then add pressure, angles, counterbalance, steering or whatever else is needed for this or that turn. The truth is that we can easily tip the skis on edge while standing still, without any focus on either inclination or angulation, which you can easily see by just doing. The angulation or inclination is a result not of tipping but of actions of the rest of the body to maintain balance (just follow the legs and incline into the turn against the turn forces or resist that, angulate and "appear still"). It is thus more beneficial to see tipping as a standalone and primary movement2 and focus on it. Its relationship to counterbalancing, angulation and inclination (as in lack of counterbalancing) must be explored independently. Most skiers are "outside foot dominant", meaning they focus more on tipping the outside foot (eversion), while some are "inside foot dominant", meaning there is a stronger action of and more focus on tipping the inside foot (inversion). 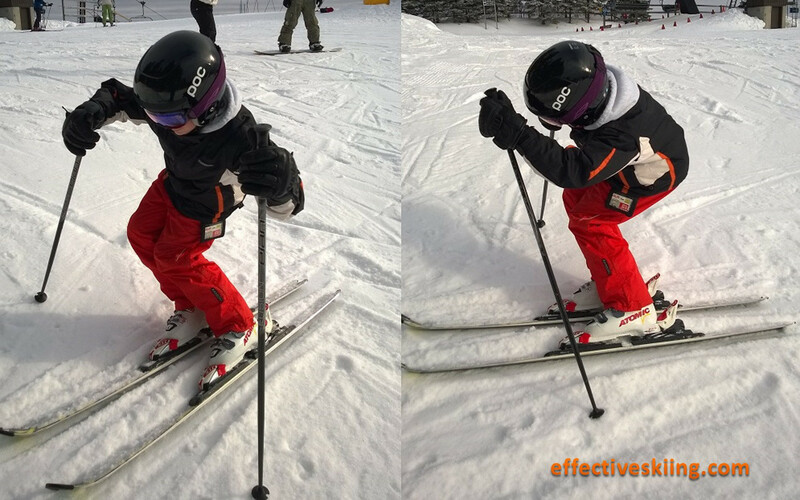 Tipping the inside foot is more important2, to maintain parallel shins, have the skis at the same angle and, executed properly, it will also drag the outside ski on edge as well (the phantom move), at lower speeds. At higher speeds, un-tipping of the old outside foot morphs into tipping the new outside foot and it is an important element of great skiing, see Tipping and flexing++! Many racers and high performance skiers have a keen focus on the inside foot - which is often lifted and tipped strongly into turns and this focus on the inside foot is now more and more a part of performance skiing, especially carving, at the higher levels. alignment - if the boots are not aligned and canted properly, tipping will be really hard to achieve and it will be hard to balance on the edge. Member-only content avilable (detailed biomechanics). Viewed 7599 times ( | Print ) this page.